Consumers these days are spending a significant amount of their time on social media platforms. Consequently, social media plays a key role in brands and firms marketing budget, which includes different marketing activities like advertising on social media and marketing communications. As firms increase their activities on social media the role of content marketing is also getting important due to these activities. Content marketing generates such kind of content that increase target audience engagement and through the campaign that they implement they drive the desired goals of the marketer. This draws the attention towards the nature of the content that works best for firms. Basically, content marketing can be seen as a strategic approach that targets on developing that kind of content which is relevant, consistent and eye-catching to grab and maintain a relevant audience and ultimately generate a profitable customer move. So content marketing is a strategic approach which shows that social media feeds are not meant to be posting things without any reasons. There should be a clear focus on what you want to achieve and how the social media content will lead you towards your defined objectives and digital marketing strategy. sConsumer behavior and psychology are also very important aspects of this topic which has addressed in ways like the content of marketing activities increase engagement of customers and also capture their attention. This paper also emphasis on the content sharing which is also known as viral marketing. Content sharing takes place when the marketer develops such kind of electronic content such as a site or a video aims for brand building. Then this content is made available to the internet users then they decide after watching the content that whether they find it worth sharing with their friends or not. If the content gets forwarded and many social media users receive it and then they also share it then it has the potential to reach a huge group of internet users at an exponential rate . This paper highlights the importance of content in online marketing which is most of the time neglected by companies. Content can create a strong impact on the customers it can urge them to share it with others as well as it increases customer engagement and trust which eventually make more loyal customers. This research is significant because it focuses on the content of the social media which can help brands and companies to engage more and more customers and can also have a sight of their needs and wants. Figure 1: Co-relation of Customer engagement, trust, loyalty and willingness to forward content. Digital content marketing and e-marketing are two overlapping terms as they resemble in their operations content marketing digitally occurs through online channels. It does not come under e-marketing strictly because digital content is not only marketed through e channels. E-marketing is a component of marketing communications and it comes with other elements of marketing communications like advertising and public relations . Content should provide the relevant information which the prospect is looking for, it should explain the audience about processes and expertise of your firm , it must show concerns towards the solution of the prospect's problems and should address their needs and it should position your company a unique provider as compare to the competitors . Informational content: The informational content of the content based social media marketing specifies the information that is presented to the customers. The primary purpose of an online content to the academic researchers should provide the general information about the company its operations products and details like this to its customers and target audience. For the effectiveness of content according to a study information is the second most component for that. Information part of a content-based social media marketing should not provide any false information as it will lose the customer’s trust and it should be specific, relevant valuable and informative. Informational aspect is an important component of the effectiveness of content and it is also necessary from the perspective of customer trust and engagement . Interactivity: Degree to which the communication system can allow one or more end users to communicate as senders or receivers alternatively with one or many other users or communication devices, either in real time (as in video teleconferencing) or on a store-and-forward basis (as with electronic mail), or to seek and gain access to information on an on-demand basis where the content, timing, and sequence of the communication is under control of the end user, as opposed to a broadcast basis . Social media marketing agencies promise to drive engagement with the clients and on this basis, they are contracted by companies on their required financial arrangements. Previously it was considered that engagement is basically huge no of followers who follow the website of social media appearance of a company or brand so companies were only focusing on increasing the traffic on their pages by paying heavily for ads. Later on, they realized that it's not only about following there should be some action from the consumers (like, comment, sharing) these actions shows customer’s engagement. As a result, the attention of industry shifted from acquiring the no of social media followers to designing an attractive content that urges them to act on their page or social media platform for better engagement and reach. Though the industry has realized about the importance of social media content they are still unaware that which content works best for which kind of business and in what ways, which kind of content will generate their desired engagement and how it will attract the customers . So marketers also need to find out what customers want and which make them like or comment on the sites. Trust is defined as when someone counts on another person’s trustworthiness and honesty during a transaction. Trust is said to be the intensity and firmness of feeling based on ambiguous evidence. Trust is an influential ingredient for the formation, expansion and, maintenance of on-going relationships between consumers and marketers. Trust is a key component for company’s growth, stability, and profitability. Although trust is a foundation for developing an imperative relationship, it also works as a fundamental and authentic part of the development of company’s performance. Because of the increasing issues, while having transactions online, e-trust has come to play a vital role in loyalty . Building customer relationships and experiences that are long-term in nature holds the key in today’s dynamic business world. The strategies of brands must revolve around that along with prompt responses to the desires and needs of the customers and generation of engagement at multiple touchpoints by utilizing content marketing. To make customers stay loyal to your brand, you need strong and enhanced positive engagement with them . Customer loyalty is when a customer spends his time with your brand, pay frequent visits and don’t switch to other brands and also refer you brands to other it shows that they are loyal to your brand. For developing loyalty content plays an important role. If you present your content on digital media to tell your brand’s story whether through your social media account or through your website or blog wherever you put it online you are considered to be a publisher. Instead of avoiding this truth, you should endorse the crucial influence of your content marketing plan and you need to present a strategy to regulate and measure its efficiency . A recent survey conducted by marketing professionals to have a clear understanding of how and in what way content is more powerful and effective in content marketing programs. Right content can attract customers and also helps in building a loyal customer base . Considering the word of mouth as an exchange between two determinants signify a need to understand the procedure elaborating the conveyance of information from the individual to individual. There are different motivations that urge a social media user to forward the content. A three-dimensional theory of interpersonal behavior is proposed by Schmutz specifically which he called FIRO (Fundamental interpersonal relations orientation). He stated that people involved in a certain kind of communication that is interpersonal because they are motivate to show one or more of their needs that are personal which includes: inclusion (seek attention by becoming part of a group), affection (concern and appreciation for others), and control (in social environment need for the exertion of power) but it’s not clear that how these motivations are linked to forwarding the content online . There is a powerful influence of content whether it is informational or operational it aids to increase customer engagement. Content should be valuable to engage with customers for a strong impact. It needs to be keenly relevant, informative, attractive, inspiring, inspecting, humorous or otherwise engaging in some solid manner. Various type of content drives various type of engagement. Reliable content when executed properly through a pre-decided framework or strategy helps to get social media engagement. H1: Content-based Social media marketing such as Informational contents, Operational contents, and Interactivity positively influence customer engagement. Trust is a critical aspect of the formation, development, and preservation for building a long-term relationship between consumers and marketers. Trust plays an important role for businesses which are operating online because it motivates them to make an online purchase and most importantly it reduces uncertainty which is faced by most of the customers while having an online encounter . When it comes to digital marketing content is an effective way for building the trust of the customers because it’s difficult for customers to believe what a company is promising whether it will provide the same thing or deliver the same promise or there will be a difference among the promise and the delivery. For building the trust first of all like informational content should be clear and relevant so that customers can find it authentic and something on which they can put their trust . Content-based social media marketing positively influence customers trust because it’s based on the trust which creates the effectiveness of social media content and customer trust . H2: Content-based Social media marketing such as Informational contents, Operational contents, and Interactivity positively influence consumer trust. Firms must have a social media encounter between company and customers before customer engagement actually happened for having a trustworthy relationship. In order to engage the customer with a brand, it is vital for companies to establish a social media dialogue in the first place that may ultimately lead to a trusting relationship. By engaging with existing and new customers using right kind of social media strategy helps in building a strong trusted relationship. So, it posits that there is a positive relationship between customer engagement and trust. H3 (a): Customer engagement positively influences customer trust. Marketers now understand that by building a loyal customer base will benefit them in long-term. Customer engagement and customer loyalty are highly correlated . By increasing customer engagement and loyalty there are more chances for customers to spread a positive word of mouth by using social media and this loyalty will positively effect the brand. So, customer engagement positively influences customer loyalty . H3 (b): Customer engagement effect customer loyalty in a positive manner. Various theories have purposed to explain about why we engage in interpersonal relationships. Denes et al. 2017 proposed a three-dimensional model to explain a person motivation to forward the content is because they want to fulfill their need for attention in a group (inclusion) they need to be appreciated (affection) and they need to exert power on their social environment(control). So by forwarding content, there is something behind which motivates to share that content  (Menezes 2013). Internet usage is also related to forwarding the content which means the more a person is socially engaged the more likely he will be to forward that online content . Similarly the more time a person will spend on social media the more engaged he will be and ultimately he will be more motivated towards forwarding an online content . It shows that customer engagement positively influences the motivation to forward content. More the engagement there will be more chances to forward the content. H3 (c): Customer engagement positively influences MTFC. Consumer trust, or confidence in a product or brand, is a huge factor in sparking conversations, influencing consumer purchasing decisions and their motivation to forward content. To help build online consumer trust and generate positive conversations around your brand online, you need an online presence and a share of voice. The most successful online marketing strategies develop that presence to build awareness and trust with key target customers. Once the trust is developed then the customer will be motivated to spread the brand to others and this motivation is because of the trust that is being developed and is positively influencing the customer motivation to forward content. H4 (a): Customer trust positively influences customer motivation to forward content. Considering that online encounters and transactions create lots of ambiguities for consumers but trust is an action for swap. Trust in the digital platform is known as e trust is believed to enhance customer loyalty, but factual recognitions are limited. We trust is said to have a direct impact on loyalty . On digital platforms, loyal customers are considered to be highly valuable. For developing a loyal customer base quality of e-service influence loyalty through trust and satisfaction. Trust helps in building loyalty and it happened because of quality of service. Considering this fact we can say that customer loyalty is positively influenced by customer trust. H4 (b): Customer trust positively influences customer loyalty. What makes customers forward the content is when the customer is engaged with the brand and is concerned about it and the other case is they are highly satisfied with the brand and they want to share the information of the brand with the other customers too. While dealing online content sharing is easier and it increases the customer loyalty as they become loyal to the brand their concern shows that because by telling others they are basically showing their loyalty towards the brand. It shows a positive significant relationship between these two variables . H5: Customer motivation to forward content positively influences customer loyalty. Content should be supportive and very clear so that there should be no ambiguity in the customers mind. Because customers feel hesitate while making an online purchase so by providing the relevant content and by building the loyalty this concern of customers can be eliminated. Customer engagement plays a major role in building that equity so customer engagement acts as a mediator between content-based social media marketing and customer loyalty. H6 (a): Customer engagement act as a mediator between content-based social media marketing and customer loyalty. Marketers find inspiration personalities on social networks and connect them in such manner that encourage them to forward their content online . Many research shows that more engagement will emphasis more on sharing the word of mouth or forwarding the content. The type of content influence the customer’s behavior of forwarding that message. More engaging, relevant, accurate and consistent content is king. Social media is not formal to only post boring and out dated content people now want variety and innovation they are fed up with the boring content. When the content is highly creative or most relevant to the customer they will definitely want to share it with others and it will lead them to forward that content. In a similar manner, higher the engagement online higher the chances of forwarding the content. So, all these things are interconnected customer engagement act as a mediator between content-based social media marketing and customer motivation to forward content. H6 (b): Customer engagement act as a mediator between content-based social media marketing and motivation to forward content. Social media helps in finding out customer requirements and what they want from the brand and to make a strategy to offer a solution for their problems. All this can happen by providing content that gives all the solutions to customer problems and meets their expectations. Trust can be converted into loyalty by showing transparency in the content. Relevant content supporting the promise helps to create trust and that trust matters a lot in building the loyalty. So, trust positively influences the relationship between content-based social media marketing and customer loyalty. H7 (a): Customer trust mediates the relationship between content-based social media marketing and customer loyalty. For building a certain level of trust there should be transparency of content means there should be no false information given or anything which creates uncertainty among the customers. Clear, relevant and transparent content helps in building trust and that trust leads to forward the content .e trust positively influence the relationship between content-based social media marketing and motivation to forward content. H7 (b): Customer trust mediates the relationship between content-based social media marketing and customer motivation to forward content. To address the research questions, the study used a content analysis to get the information about the social media marketing inputs. In the past, this approach was considered to be effective for understanding a different kind of contents like print ads, TV commercials, indoor and outdoor advertising, and websites. Though create strategies of different media are not addressed in terms of their effectiveness it is effective in investigating the strategies used by brand and social media channels. This research is related to content-based social media marketing so for that data survey that was conducted in different places with those people who are the users of social media. The survey was administered from undergraduate, graduate and masters and above who use social media. It was written in English language and communicated. For the data collection, the structured questionnaire of 5 Likert scales was used and it took 3 weeks for the collection of data from the respondents. The questionnaire consists of 49 questions for measuring the results of different variables and each variable has 7 to 11 questions. The figures about the collected data for the research are shown in the Table 1 below. Tables 2 and 3 are classified into different sections, giving the detailed information about variables used in the research. Exactly 250 questionnaires is distributed among the prospects to collect the data, of which 200 questionnaires are considered valid. The response rate results in 79.8%. According to the collected data sample, 200 respondents are found to be active participants in online communities, out of which 122 are male and 78 are female. These statistics show that males are more active participant’s online social media platforms. The descriptive analysis gives the important and valid details about the data and helps the researcher to analyze the data in various aspects. Preliminary analysis is involved in this. It gives details about no of respondents, max and min value means value and standard deviation, mean gives the important information that how much strength is the result of any particular question. The Cronbach’s alpha values show that approximately should exceed the cutoff value that is 0.7 and it gives evidence about acceptance of the reliability among items, and average variance explains that all constructs were higher the cutoff level i.e. 0.5 and it indicates that average convergent validity for our measures is simple. The Cronbach’s alpha value of OC, IF and INT is 0.972, 0.957 and 0.973 which shows that items have relatively high internal consistent. And the value of CE and ET is 0.957 and 0.958 which is also greater than 0.7 and it depicts that the items are highly consistent in this variable too. Value of EL is 0.936 which also shows the consistency of data and the value of MTFC also have more than 0.7 value i.e. 0.938 so these variables are also having highly consistent data. The results of the study highlight the importance of content-based social media marketing and its ultimate impact on customer loyalty and motivation to forward content. Also, it can be seen that customer engagement and customer trust play a significant role in establishing this relationship. There is a positive relationship between content-based social media marketing and customer engagement and customer trust. Both relationships are found to be significant having a p value of 0.000. Furthermore, customer engagement and customer trust partially mediate the relationship between content-based marketing and customer loyalty and content-based marketing and motivation to forward content. Several academic implications can be drawn from the results of this study. The results of this research showed that the content of social media marketing activities plays a significant role in improving e-marketing effectiveness. As suggested in the previous literature, companies must make the valuable information available to users through internal search engines. Information must be right, up-to-date and relevant to the customers’ requirements . According to the findings, this hypothesis is accepted. Findings also contribute that there is a positive relationship between social media marketing content and e-marketing effectiveness through consumer trust. Corbitt et al. stated that consumers are likely to make online purchases if they are able to trust an online channel. In an online environment, trust is a key component that enhances customer loyalty and their commitment towards a brand . Our findings also show the mediating effects of customer engagement and trust on the content of social media and customer loyalty and customer motivation to forward content. They both enhance the relationship between these variables because increased engagement due to the relevant and required content can increase customer loyalty and when the content is actual and according to what a company or brand promises with what customer want from the brand and what they are looking forward to a sense of trust is created between the brand and customers which eventually increase the no of loyal customer and also customers will be interested in sharing the content. So both this hypothesis are also accepted showing that customer engagement increases loyalty and customer motivation to forward content and also e-trust increases loyalty along with the motivation to forward content. The above-mentioned analysis supports our research and it shows that content-based social media marketing is a strong mechanism which positively influences customer loyalty and motivation to share the content with others, the sense is that when the content is impacting full and attractive it will definitely catch the attention and engagement of customer and trust will increase their loyalty with their motivation to forward content. Results show satisfactory response towards our research and many previous studies support this argument. Firstly, content should gain attention and generate leads. Secondly, online channels must try to increase their customer traffic by generating engaging and useful content. It will ultimately encourage buyers to purchase online and will result in increased sales for the company. Thirdly, content-based marketing can be useful for companies to increase awareness for their brand and develop online community to strengthen image of the brand and establish customer loyalty. This study has some limitations that should be taken into account when drawing conclusions. In this research, we focused on the importance of content based social media marketing in generating trust and consumer engagement. Further research could include other factors that influence consumer decision making and trust in digital environment, such as website design, security, design dimension etc. Another limitation of this study comes from the chosen population and sample. All the respondents were selected from a single metropolitan city. Whereas, respondents from other part of the world may have different reasons to form trust in a digital environment. Future research can conduct an expoloratory study first to identify the reasons people engage or disengage with a brand in online setting and then test the significance of each factor empirically. Watts DJ, Peretti J, Frumin M (2007) Viral marketing for the real world. Harvard Business School Publication. Rowley J (2008) Understanding digital content marketing. Journal of marketing management 24: 517-540. Gagnon E (2014) Goodbye, B2B Brand Marketing: Developing Content-Based Marketing Programs for the Post-Marketing Era. International Management Review 10: 68-71. Rahimnia F, Hassanzadeh JF (2013) The impact of website content dimension and e-trust on e-marketing effectiveness: The case of Iranian commercial saffron corporations. Information & Management 50: 240-247. Fortin DR, Dholakia RR (2005) Interactivity and vividness effects on social presence and involvement with a web-based advertisement. Journal of business research 58: 387-396. Valentino-Devries J, Singer-Vine J, Soltani A (2012) Websites vary prices, deals based on users’ information. Wall Street Journal 10: 60-68. Lee D, Hosanagar K, Nair HS (2014) The effect of social media marketing content on consumer engagement: Evidence from Facebook. Stanford Graduate School of Business. Reichheld FF, Schefter P (2000) E-loyalty: your secret weapon on the web. Harvard business review 78: 105-113. Anderson RE, Srinivasan SS (2003) E‐satisfaction and e‐loyalty: A contingency framework." Psychology and marketing 20: 123-138. Coyle JR, Thorson E (2001) The effects of progressive levels of interactivity and vividness in web marketing sites. Journal of advertising 30: 65-77. Chan YY, Ngai EW (2011) Conceptualising electronic word of mouth activity: An input-process-output perspective. Marketing Intelligence and Planning 29: 488-516. Wu CS, Cheng FF, Yen DC (2008) The atmospheric factors of online storefront environment design: An empirical experiment in Taiwan. Information and Management 45: 493-498. Du Plessis C (2017) The role of content marketing in social media content communities. South African Journal of Information Management 19: 1-7. Brodie RJ, Ilic A, Juric B, Hollebeek L (2013) Consumer engagement in a virtual brand community: An exploratory analysis. Journal of Business Research 66: 105-114. 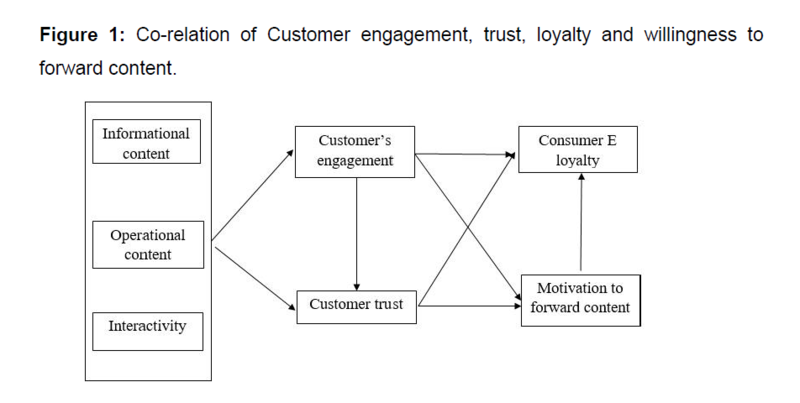 Vivek SD, Beatty SE, Morgan RM (2012) Customer engagement: Exploring customer relationships beyond purchase. Journal of Marketing Theory and Practice 20: 122-146. Menezes RC (2013) Advantages of strong brands on customer reach and customer engagement on social media marketing. Erasmus University. Sun T, Youn S, Wu G, Kuntaraporn M (2006) Online word-of-mouth (or mouse): An exploration of its antecedents and consequences. Journal of Computer-Mediated Communication 11: 1104-1127. Belch MA, Krentler KA, Willis-Flurry LA (2005) Teen internet mavens: influence in family decision making. Journal of Business Research 58: 569-575. Ribbink D, Van Riel AC, Liljander V, Streukens S (2004) Comfort your online customer: quality, trust and loyalty on the internet. Managing Service Quality: An International Journal 14: 446-456. Churchill EF, Nelson L, Denoue L, Helfman J, Murphy P (2004) Sharing multimedia content with interactive public displays: a case study. Proceedings of the 5th Conference on Designing Interactive Systems: Processes, Practices, Methods, and Techniques, ACM pp: 7-16. Smith T, Coyle JR, Lightfoot E, Scott A (2007) Reconsidering models of influence: the relationship between consumer social networks and word-of-mouth effectiveness. Journal of advertising research 47: 387-397. Chakraborty G, Srivastava P, Warren DL (2005) Understanding corporate B2B web sites' effectiveness from North American and European perspective. Industrial Marketing Management 34: 420-429. Corbitt BJ, Thanasankit T, Yi H (2003) Trust and e-commerce: a study of consumer perceptions. Electronic commerce research and applications 2: 203-215.